By Jonathan RabanPublished in 1935 in the middle of the Depression, William Empson's Some Versions of Pastoral casts a hard modern light on sixteenth- and seventeenth-century poems about shepherds and shepherdesses with classical names like Corydon and Phyllida. Pastoral, Empson wrote, was a "puzzling form" and a "queer business" in which highly educated and well-heeled poets from the city idealized the lives of the poorest people in the land. It implied "a beautiful relation between the rich and poor" by making "simple people express strong feelings...in learned and fashionable language." From 1935 onward, no one would read Spenser's The Shepheardes Calendar or follow Shakespeare's complicated double plots without being aware of the class tensions and ambiguities between the cultivated author and his low-born subjects. Although shepherds and shepherdesses have been in short supply in the United States, versions of pastoral have flourished here. The cult of the Noble Red Man, or, as Mark Twain derisively labeled it, "The Fenimore Cooper Indian" (a type given to long speeches in mellifluous and extravagantly figurative English), is an obvious example. So is the heroizing of simple cowboys, farmers, and miners in the western stories of writers like Bret Harte, the movies of John Ford, and the art of Frederic Remington, Charles M. Russell, Maynard Dixon, and Thomas Hart Benton. Both Uncle Tom's Cabin and The Grapes of Wrath might be read as pastorals in Empson's sense. The chief loci of American pastoral have been the rural South and the Far West, while most of its practitioners have been sophisticated easterners for whom the South and West were destinations for bouts of adventurous travel. They went equipped with sketchpads and notebooks in which to record the picturesque manners and customs of their rustic, unlettered fellow countrymen.Raban notes how Lange's famous Migrant Mother photo fits the pastoral template:The picture defines the form of pastoral as Empson meant it, and the closer one studies it, the more one's made aware of just what a queer and puzzling business it is. A woman from the abyssal depths of the lower classes is plucked from obscurity by a female artist from the upper classes and endowed by her with extraordinary nobility and eloquence. It's not the woman's plight one sees at first so much as her arresting handsomeness: her prominent, rather patrician nose; her full lips, firmly set; the long and slender fingers of her right hand; the enigmatic depth of feeling in her eyes. It also emerged that Florence Thompson was not just a representative "Okie," as Lange had thought, but a Cherokee Indian, born on an Oklahoma reservation. So, in retrospect, Migrant Mother can be read as intertwining two "mythical cult-figures": that of the refugee sharecropper from the Dust Bowl (though Thompson had originally come to California with her first husband, a millworker, in 1924) and that of the Noble Red Man. There is a strikingly visible connection, however unnoticed by Lange, between her picture of Florence Thompson and Edward S. Curtis's elaborately staged sepia portraits of dignified Native American women in tribal regalia in his extensive collection The North American Indian (1900–1930), perhaps the single most ambitious—and contentious—work of American pastoral ever created by a visual artist.Nor is this a coincidence. Lange learned to romanticize the West from her first husband Maynard Dixon. In particular, she learned it from photographing Hopi and Navajo Indians.Lange was twenty-four when they married in March 1920, Dixon twenty years older. She was still a relative newcomer to San Francisco, having arrived there from New York in 1918; marrying Dixon, she also embraced his nostalgic and curmudgeonly vision of the Old West. A born westerner, from Fresno, California, he stubbornly portrayed the region as it had been before it was "ruined" by railroads, highways, cities, Hollywood, and tourism. In his paintings, the horse was still the primary means of power and transportation in a land of sunbleached rock and sand, enormous skies, cholla, and saguaro cacti, with adobe as its only architecture and Indians and cowboys its only rightful inhabitants. Although Lange had already established herself as an up-and-coming portrait photographer in San Francisco, her pictures on these trips to the desert were so faithful to her husband's vision of the West that one might easily mistake many of them for Maynard Dixon paintings in black-and-white. So she caught a group of Indian horsemen, seen from behind, riding close together across a sweep of empty tableland; a line of Hopi women and a boy, clad in traditional blankets, climbing a rough-hewn staircase trail through the pale rock of the mesa; a man teaching his son how to shoot a bow and arrow; families outside their adobe huts; and somber, unsmiling portraits of Indians whose faces show the same weary resignation to their fate as the faces that Lange would later photograph on the breadlines and in migrant labor camps. It was among the Hopi and the Navajo that she picked up the basic grammar of documentary, with its romantic alliance between the artist and the wretched of the earth.To sum it up, Indians inspired Lange to pursue documentary-style photography, which culminated in her famous Migrant Mother, a portrait of an Indian. Without Indians, she still might've had a career, but it wouldn't have been as successful. For more on the subject, see Migrant Mother Was Cherokee and Romantic Indians. 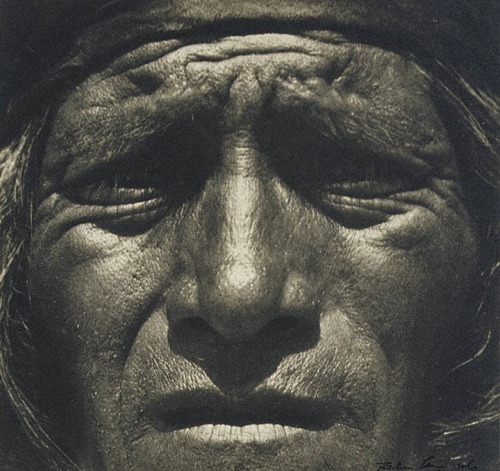 Below: Lange's mask-like photo of a Hopi Indian.